Yesterday, August 24, 2018, Senator Francis "Kiko" Pangilinan celebrated his birthday, and his stepdaughter KC Concepcion posted a sweet birthday greeting for him today, August 25. The daughter of Sharon Cuneta and Gabby Concepcion wrote, "Happy birthday, Dad. I hope you like the book on health [and] longevity because with the knowledge, science, and FARM that we have today, we have no excuse but to go, grow, [and] GLOW!!! Okay, but on a more serious note, ILY, @kiko.pangilinan [and] thank you for choosing to have me in your life 24 years ago." In March 2018, Sharon and Senator Kiko celebrated their 24th anniversary as a couple. They got married on April 28, 1996. 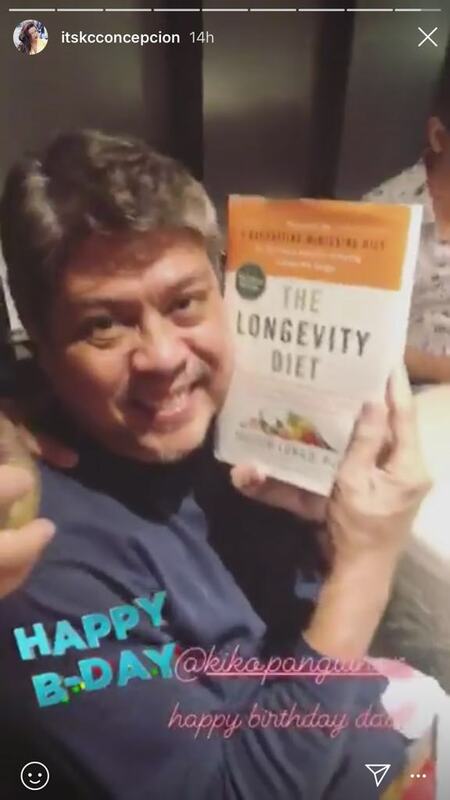 In her Instagram stories, KC posted a video of her stepdad receiving her gift, a book titled, The Longevity Diet. She could be heard saying, "All right, Dad! May you live long. Take care of your health. Healthy is wealth! Happy Birthday!" According to her Instagram stories too, the entrepreneur-singer-actress arrived in the Philippines hours before giving her dad the present. She flew in from California, USA., where she had spent some quality time with her long-time suitor Pierre-Emmanuel Plassart.